Ye who art unlike us shall not pass. Or something. If you have a high savings rate and are working toward financial independence, chances are good that you’ve run into some issues sharing your goals and dreams with other people in your life. Maybe you’re in your twenties and you suddenly ask your friends to come over your house to drink instead of going to the bars. You reveal that you’re into saving money, and your friends return expressions of complete bewilderment. Or you are in your thirties and your brother asks why you are driving an older car when you can obviously afford better? Perhaps you’re in your forties and all of your co-workers are going on midlife-crisis style fast vacations to Europe, Vegas, Taiwan and so on for some expensive adult debauchery and you mention that you don’t do that sort of thing. It is at this point that folks turn their head askance and start wondering about you. Like, specifically, what’s wrong with you? Why aren’t you like them? You have choices here. You can a) tell these people all about your plans to leave the rat race early or b) you can lie a little. For the moment let’s say you’re going to choose option a). What happens? You: So actually I’m saving and investing money because if I have enough, I could do something different with my life. Retire early. Stop working entirely. Pursue my own dreams and interests. Other: Yeah, I’m saving too. I put 15% in my 401(k) every year. But I can still afford to treat myself. You: I’m saving 55%. This will get me to retirement in about fourteen years. Right now I’m six years in, so I’ll probably be done in seven or eight. Sooner, if I can save even more. At this point, Other pauses, processing this unexpected turn in the conversation. Other’s pattern-matching brain is used to analyzing conversational flows, recognizing familiar tracks, and selecting pre-approved responses which align with the topic. There are none in the registry. New material must be produced on the fly. This requires effort. Other: You’re what? That’s impossible… No one can save 55%. Other is likely looking at his feet now, while you visualize a spinner superimposed over Other’s head, signaling the intensity of activity upstairs. You: Sure people can. I’ve been at it for a while. Other: How do you do it? There is a brief flicker of interest in Other’s voice. You: I changed parts of my lifestyle to eliminate spending on things that don’t make me happy. And I reduced spending in other areas by living in a more modest house, using stuff until it’s actually broken, sending my kids to public schools instead of private, and not driving much. There are a lot of tricks. I can send you links to websites that offer some terrific advice if you’re interested. Aha! Now Other is looking you in the eye again, because what you’ve described sounds like deprivation and sacrifice. Other accesses his database again and finds that there are appropriate replies for these types of exchanges. Other: Well, good for you. But that’s not for me. That’s just no way to live, buddy. I work hard and I play hard. Have fun at home while I’m in Vegas. You’re a big idiot. No, YOU’RE a big idiot! After a few of these discussions, which create disappointment and frustration for both parties, you will likely start choosing conversational option b (lying) which makes the whole thing end much more quickly. You: I just can’t afford it. My wife and I have already allocated our yearly 10K annual vacation budget for a 2-week blowout in Hawaii come January. Other: That sounds awesome, I went there last year. I’ll email you my hotel details, it was primo luxury, you have to stay there. And it’s done. In this case, there’s no discomfort on the part of Other. Just understanding and acceptance, because you’re just the same. Smoother than buttermilk. But for you, the one who felt obligated to lie, a gooey disgusting ball of moral filth will remain in your consciousness. You didn’t want to keep your life hidden. Quite the opposite: you’d love to share how great you feel on your path and invite Other along. So why can’t you? Why is it so hard to talk about financial independence with people who don’t already share the goal? I think it comes down to genetics and programming. We’re predisposed to certain traits. Variations in environment (experiences, sensory data input, social circles and cultural messaging) further emphasize some of them and you get what we have right here. What personality types are naturally attracted to being financially independent? There’s plenty of discussion around this, much of it focusing on the Myers-Briggs indicator. A poll on the Mr. Money Mustache forums shows that all rational types combined — ENTJ + ENTP + INTJ + INTP — account for 70% of people striving to FIRE. When I say “rational types” I’m talking about a a designation created under a different personality profiler, the Keirsey Temperament Model. This model fits our discussion a bit better because the buckets are broader, simplifying analysis. The Keirsey model has four personality types to Myers-Briggs 16, allowing for a cleaner breakdown of data. Their Rational bucket holds the four Myers-Briggs types listed above. Rationals and Idealists on the left half, Guardians and Artists on the right. Noteworthy in the chart are the Guardians are on the upper right. They correspond to ESTJ, ISTJ, ESFJ, and ISFJ personality types. On the MMM poll, they represented just 9%. This is only part of the puzzle, though. The next bit has to do with what percentages of the population slot into each of these personality types. And it turns out that Guardians outnumber everyone, making up about 43% of citizens at-large. There’s also a fair slice of idealists, at 30%. Rationals and Artisans round out the bottom at about 13% each. Simple. I want to understand, given the typical conversation I outlined above, who is most likely talking to who. Specifically, I want to know more about this Other character and why discussing savings rates and not working forever sets off such alarms. The conclusion I draw is that since you want to FIRE, and you have an office job, you’re most likely a rational, or, if not, perhaps an idealist. And since you’re in an office, you’re probably talking to a Guardian. I believe that the majority of artisans and some idealists self-sort out of corporations and institutions with strict rules — the structure usually ends up being too much to bear. They become teachers, social workers, priests, fitness instructors, therapists, masseuses and so on. This leaves mostly guardians, rationals, and a few idealists in your standard workplace prison. You may be a guardian talking to a guardian. It’s not all that unlikely. If this is the case, you have been converted to non-standard thinking in this particular area of your life (finance). Congratulations. I’m sure you are still confronted with the same problems talking to other Guardian types about your FIRE plans. More on this below. Read through a few of the descriptions for the personality type. These are pasted directly from the Keirsey website. They follow the rules and conventions of their cohort or group and expect others to as well. Guardians tend to be dutiful, cautious, humble, and focused on credentials and traditions. Guardians can have a lot of fun with their friends, but they are quite serious about their duties and responsibilities. Guardians also believe in law and order, and sometimes worry that respect for authority, even a fundamental sense of right and wrong, is being lost. Guardians believe in following the rules and cooperating with others. They are not very comfortable winging it or blazing new trails; working steadily within the system is the Guardian way, for in the long run loyalty, discipline, and teamwork get the job done right. Guardians are meticulous about schedules and have a sharp eye for proper procedures. They are cautious about change, even though they know that change can be healthy for an institution. Better to go slowly, they say, and look before you leap. Guardians often experience stress when rules, expectations, and structure are unclear, or when those around them do not act according to established norms. I don’t know about you, but I had me at the first line, ‘expected to follow rules and conventions.’ Then this one cemented it: ‘They are not very comfortable winging it or blazing new trails.’ If you’re going to FIRE, then you are doing something different, unexpected, and scary. Guardians have determined that the cultural norm (i.e. the behavior of the majority) is to spend most of what they make and complain away any issues arising from this behavior. They don’t particularly want to sit down and analyze their patterns and think about improvements or optimizations. Instead, they’re most concerned with acceptance, consistency of group beliefs and consensus. Your behavior causes dismay because it doesn’t match what they’re used to. And anything that they’re not used to has the potential to alarm a Guardian. From their perspective, your ideas and behavior appear to be risky, because they’re different. Guardians hear from politicians and pundits that it’s their duty to spend money to keep the economy going, and they take their responsibility fairly seriously. Guardians have more difficulty imagining a life without their job because they tend to believe the rhetoric that the act of work itself is a moral Good, to be prized as its own end. Don’t think of the Borg, Don’t think of the Borg, Don’t think of the Borg. D’oh! Guardians don’t grow up questioning everything as intensely as Rationals. Guardians want to figure out how the world works, integrate into it, and copy it exactly. Rationals want to figure out how the world works and then architect a better one. Rationals aren’t afraid of going against the grain as long as their decisions make sense and can be backed up by data and, ultimately, their own judgment. Rationals will sacrifice relationships in order to make the correct decision. Guardians tend to trust the judgment of the group — in this case, the broader culture — above their own. Now that you have a clear sense of how Guardian types tend to think and function, let’s get back to that original conversation. After listening to you and your insane ideas about retiring early and depriving yourself of both spending and work, your Guardian conversational partner is going to be concerned. You’re an anomaly compared to just about everyone else they know. They’ll see you as the ugly duckling, apart and alone. The last thing a Guardian wants to feel is alone and isolated. After all, they they place a high value on tradition and fitting in with the culture, exactly so they never have to experience these feelings. This is why they ask what is wrong when you tell them you don’t want to go and have lunch at Chipotle with the rest of the gang. They assume that you are standing apart because you have a problem. It would never occur to them that you’re doing it by choice, because they aren’t wired to think that way by default. They think you should want to be with the crowd, for the same reasons that they want to. It’s not that Guardians are stupid. On the contrary, they’re are pretty bright on average. Part of the issue is emotional. They’re actually worried about you because if they were in your position (isolated) they would be writhing in pain. In short, it’s not their fault that they think the way that they do. They just do. On the flip side, if you’re a Rational, it’s not your fault that you are the way you are, either. For you, it’s more important to resolve your own perceived pain points in life — lack of freedom and choice, the relentless forced march of your work life, the demoralizing amount of never ending job-related junk that clutters your mind — than it is to be just like everyone else. The two of you are merely prioritizing things differently. So be sympathetic when you’re trapped in one of these conversations. The miscommunication is a simple matter of genetics, wiring, and programming. Yep, after all of that, it’s still possible to kick it up a notch. Let’s go. The Houses in Harry Potter appear to be roughly based on the Kiersey Temperament models. So when you find yourself having the same disappointing conversation with someone, remind yourself that for all intents and purposes, you are Cho Chang talking to Justin Finch-Fletchley. Breathe. It’s OK.
You might be wondering at this point where the sorting hat placed me. Well, it couldn’t complete its function, actually. You see, it requires human souls as input data in order to direct each student to their House. And, much like Cyborg Superman, I don’t have one. I personally choose option B when talking to people at work about money. I lie to conform to expectations because I grew weary of having conversation A and alienating people. I want to be perceived as team player at work because I work with Guardian types who value that above all else. In short, I want people to like me, whether or not I like them, for a very selfish reason. When people like me, work is easier. And I no longer feel guilty about it, the lying. After all, I’m doing it for the protection of Other, and this good deed cancels out the bad in my book. You might say that I’ve learned to prefer trusting the Guardian in myself when I’m at the office, taking advantage of my ability to not go with my personality preferences at all times. ** You can convince Guardians to be frugal and adopt the FIRE lifestyle over time. It takes effort and helps if you can show them that lots of other people do it too, so they don’t see it as such an isolating way to exist. I recommend this approach with friends and family you may care about. ** This is why I don’t worry much about frugality catching on to the point where the lack of spending crashes the economy. There are too many Guardians in the world, and they’ll power spending as long as our national corporate advertising machine keeps doing its thing: setting the default consumer norms, thereby programming the majority of American culture to continue buying lots of stuff. ** Keep in mind that just because you’re predisposed to behave a certain way doesn’t mean you have to. Plenty of rationals have powerful creative cores. Plenty of artists can think logically, save, invest, do math and fix cars, and so on. All these profiles do is draw attention to the default settings on individuals’ personalities. You can flip a switch and use the alternate side of yourself if you wish, and in fact, it’s good to do this so you can practice being a well rounded human being. Even Einstein got emotional once in a while. Great post! I can totally relate to this and it makes so much more sense now why I don’t feel comfortable talking to people in my office about FI. I’m enjoying your blog (found you from one of your forum posts on MMM). I’m the same age as you and a couple years behind you in FI so I’m really looking forward to following your journey. We share a lot of the same hobbies as well. Good luck with everything! Thanks for stopping by – I’m glad you’re finding some of the content interesting. And congrats on only being a few years away from your goal, that’s fantastic. Keep up the great work. Well, I took the Keirsey test. I’m a rational all right. I’ve actually chosen path A sometimes to my detriment. I once laid it out to my manager who was actually pretty intrigued but i probably shouldn’t have done that. Negating that one incident I feel like i want to evangelize the FIRE lifestyle. Few things i’ve ever run into in my life have been so clear and logical. I’ve actually gotten a few people at least thinking differently about spending if not committed to change. Dude, this is an outstanding discussion of personality types as it relates to the whole early retirement/FI process. As an aside, I feel that the healthier we become psychologically, the easier it is to break out of our default patterns. Our personality and ego defend us and we get stuck. You may enjoy a personality model called the enneagram which looks at things in a slightly different way. 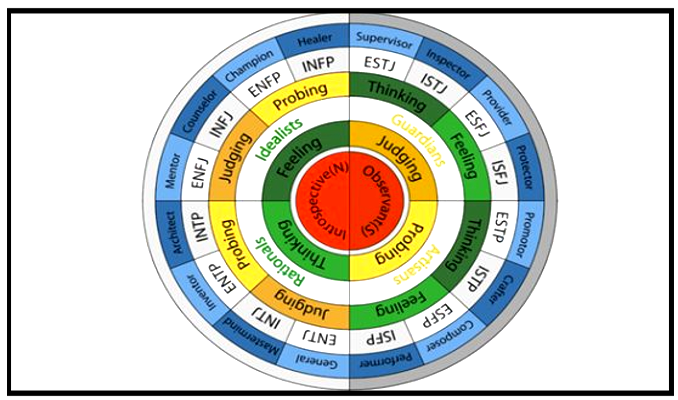 It is less well known as Meyers-Briggs and those derivatives but it is very interesting. Best book I’ve read on this is by Riso and Hudson: The Wisdon of the Enneagram. In one of Terry Pratchett’s books (I think it was Unseen Academicals, but I’m not 100% sure) one of his characters talks about the crab pot, where the pot doesn’t need a lid because all the other crabs drag any escapees back down. She likens it to anyone who’s working to change their life situation and how so many people around them will try to drag that escapee back down where everyone else is. That’s what I think of whenever I read about the reactions FI people get from friends and family. Also, my husband is super into FI stuff (particularly MMM) and I support that in a vaguely “Okay, that sounds nice” way, but I’m finding this blog much more relatable and I’m getting a little excited about some of his wacky ideas.